I was born and brought up in India where I earned my Bachelors in Agricultural Sciences from Punjab Agricultural University (2008-12). During my M.S. in Plant and Environmental Sciences from New Mexico State University, NM (2012-14), my research was mainly focused on the physiology of chile pepper plants under drip irrigated partial root zone drying (water management practice). I worked with various soil moisture sensors and meteorological sensors for irrigation management. My current project in Dr. Reinhardt’s lab is to quantify the carbon and water fluxes in three dominant tree species (juniper, Douglas fir, aspen) in the Reynolds Creek Critical Zone Observatory (http://criticalzone.org/reynolds/) and in different species and subspecies of sagebrush along an elevation gradient using sap flux sensors, litter fall traps and automated dendrometers. This will allow us to quantify aboveground inputs of carbon to the soil at leaf to ecosystem scales. Hometown: Punjab, India. I was born and raised in Wyoming where I grew up hunting, fishing, and enjoying the outdoors. My first two years of college were spent at Northwest College in Powell, WY. Afterwards, I transferred to Idaho State University and earned my Bachelors of Science in Biology. My current project in Dr. Reinhardt’s lab is to quantify how variation in annual snowpack affects annual forest productivity/greenness along an elevation gradient in the northern Rocky Mountains. Hometown: Casper, Wyoming. Steven studied causes of seedling mortality in first-year lodegepole and ponderosa pine seedlings during drought. He was interested in basic questions in conifer seedling biology such as what is the carbon balance of first-year seedlings. He is now in a PhD program at the University of Wisconsin, Madison. Theresa quantified intra-specific variation in hydraulic function traits along an elevation gradient in Douglas fir trees. She was interested in elucidating what abiotic factors cause lower treeline in montane forests in western U.S. She is now working as a Field Biologist for the BLM in Tucson, AZ. Maria investigated the impacts of human-noise on ecosystem functioning in the Phantom Gas Field project, She is now working as a regional biologist for ID Department of Fish and Game. Lindsay is interested in community ecology, ecophysiology, and climate change biology. Her thesis research investigated physiological and structural adjustments in sagebrush, under both current and future climate scenarios. She is now working as a research pathologist for a nursery supply company in Massachusetts. Kate investigated the effects of altered precipitation seasonality on net ecosystem carbon exchange in Intermountain sagebrush steppe. She now is living in Boise, ID and is an Academic Advisor for StudySync (an educational software company). Ike completed a BS in Biology at Idaho State University. As a research technician in the Reinhardt lab, he enjoyed increasing his knowledge of plants and studying insect herbivory at the University of Idaho’s Taylor Wilderness Research Station in the Frank Church Wilderness. He is now employed at Idaho BioScience in Hailey, ID. Cristie Cole, NSF EPSCoR REU Summer 2013. 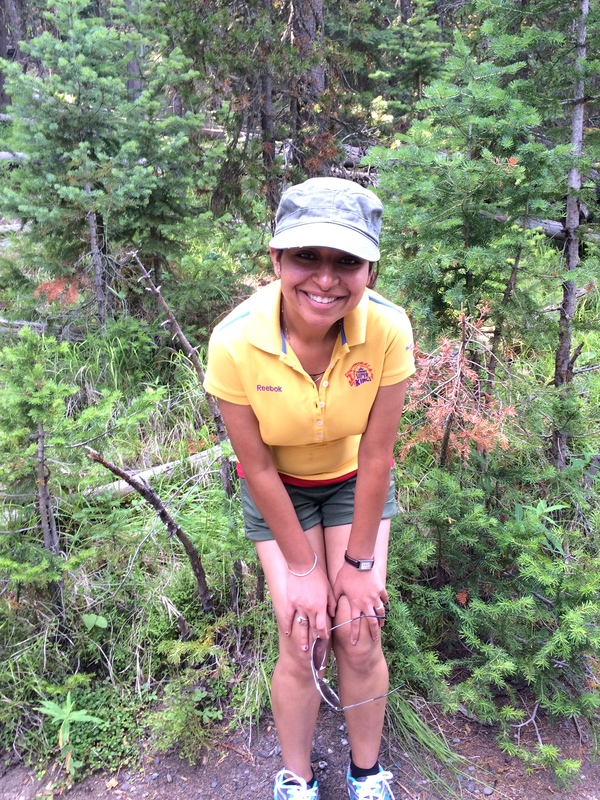 Cris was a hiker-extraordinaire during summer 2013, where she investigated how experimental snowpack manipulations affected the physiology of trembling aspen (Populus tremuloides) at leaf to whole-tree scales. She hiked into Gibson Jack RNA weekly with tons of equipment, and fought off moose, stinging nettle, and poison ivy for the sake of science. Hometown: Idaho Falls, ID.